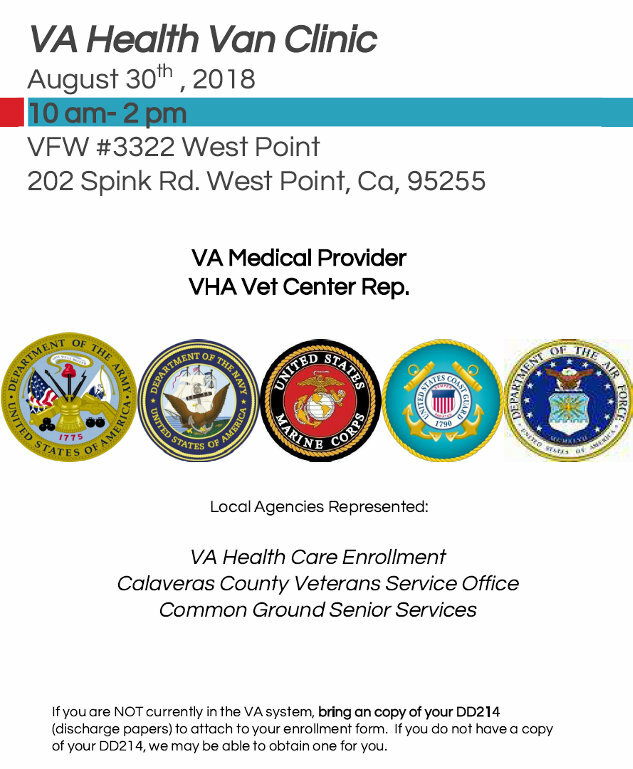 West Point, CA...VA Health Van Clinic, August 30th , 2018, 10 am- 2 pm, VFW #3322 West Point, 202 Spink Rd. West Point, Ca, 95255. Local Agencies Represented: VA Health Care Enrollment, Calaveras County Veterans Service Office, Common Ground Senior Services, VA Medical Provider, VHA Vet Center Rep. If you are NOT currently in the VA system, bring an copy of your DD214 (discharge papers) to attach to your enrollment form. If you do not have a copy of your DD214, we may be able to obtain one for you. Event occurs on 08/30/2018 from 10:00 AM to 02:00 PM. THANK YOU! !… For Taking a Chance on LOVE! Central Calaveras Fire & Rescue Protection District Needs You!